SCATTERY Island in Kilrush was amongst 18 European destinations to be officially presented with their EDEN (European Destination of Excellence) award at a ceremony in Brussels. The prestigious EDEN competition, which is staged every two years in each EU country along a specific shared theme, is managed here by Fáilte Ireland and is designed to encourage and promote a more sustainable form of tourism development. Scattery Island was the outright winner under the theme of Tangible Cultural Destination. The two runner-up destinations were Ceide Coast in Mayo and The Norman Way in Wexford. The theme focused on small, emerging, non-traditional destinations in off-the-beaten-track locations that offer an authentic cultural tourism experience. 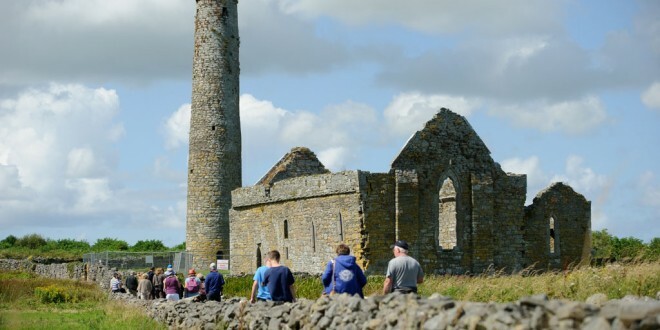 “We have always recognised Scattery Island as the jewel in the crown for local tourism and it’s a fantastic product with a wealth of culture and history. “This award is recognition of the amazing experience a trip to Scattery Island is but also an acknowledgement of what can be achieved through collaboration of community groups and state bodies, such as the OPW and Clare County Council, who have supported, protected and developed the island over the years,” Ian Lynch of Scattery Island Heritage and Development Group said. Accepting the award, Irene Hamilton, also of the Scattery Island Heritage and Development Group, said it will bring international recognition to Scattery Island, which will greatly aid the area’s tourism product. “This in turn will springboard Scattery Island and the greater area of Kilrush and West Clare as a family-friendly tourist destination, providing us locally with the opportunity to manage the product in a sustainable manner, creating jobs and enhancing and development of the local economy,” she added. SCATTERY Island in Kilrush was amongst 18 European destinations to be officially presented with their EDEN award at a ceremony in Brussels.